I've always been interested in audio. From hearing the news (NPR, KFOG) to following sports (Jon Miller, Dan Rusinowski) to listening to Gene Burns teach me how to make my first Thanksgiving turkey. I used to take these drives to Moab, UT from San Francisco, CA for a few weeks of camping and bike riding. The radio was my co-pilot. You'll note a bulk of these are from Dan Benjamin's 5by5 network. That's no fluke - Dan does a great job in adding guests and keeping the content fresh. Listening to Dan's podcasts got me thinking about doing my own. I'm always up for increasing my visibility and if I have something to offer a larger group of folks, I'm game for trying something new. So, I thought I'd give podcasting a try. It's gone really well. I've learned a lot about collaboration, recording, microphones, GarageBand, analytics, feeds, interviewing, iTunes, Skype, marketing, and much, much more. By all measurements, it's been a success. I've learned a ton about using Agile as a central project management technique (the podcast topic). It's been over two months (and nine episodes!) and the number of podcast subscribers continue to increase. And, we're having a lot of fun doing it. There are some bumps I'm ironing out, and I'm continuing to learn how to be a better interviewer and podcaster. With all that in mind, I thought I'd provide a quick overview on how I got started. Pick a topic It can be something you're interested in learning more about or something you're an expert in. Pick a topic that gets you excited and one which you can invite guests to join you. 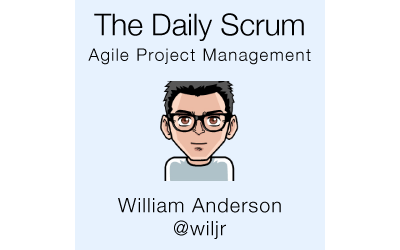 For my topic, I chose Agile Project Management. I'm not a developer (although I work with a bunch of them) but I am a project manager and learning how to best work with my team is important to me. Pick a day / time / frequency This depends on your schedule mainly - since you'll be doing most of the legwork - but you should work closely with your guest's schedule as well. By initially locking down a day / time / frequency for the recording, it will help you prepare and settle into a groove. I initially picked Thursday afternoon / evening for recordings. I thought this would give me enough time on Thursday night or Friday morning to edit the podcast, wrap it all up, then post it on iTunes before the weekend. Set it all up You'll want to get a nice mic along with a comfortable pair of headphones. Since you'll be listening during the podcast, while editing the podcast, and the final cut, you'll want something that sits on your head / ears comfortably. I'm not an expert when it comes to mics. You can look on Amazon and find out what others are using. I'd definitely ask around and try one out if possible. Get a pop filter. Either pick one up or make one. They are a huge help. Your recording software will likely be whatever you're most familiar with. I picked up the Yeti USB Microphone (aff), and it's worked great. I use it for recording as well as for all telephone calls (I'm a Google Voice guy). Here's the pop filter (aff) I picked up. It's good. It works. I don't like the clamp as it has some awkwardly-shaped parts. I'm on a Mac Mini using Skype, and am using Ecamm's Call Recorder for Skype. I'm using GarageBand to edit, mix, and produce then iTunes to publish. Hosting, XML file, Feeds This was the toughest part for me but now it's a cinch. Like everything new, it took a few times to get it right. I think there are free hosting options available. To be honest, I didn't look too far into these options since I already have a hosting account with Laughing Squid. My podcasts are relatively small and I don't have thousands (or even hundreds) of subscribers streaming them (yet) so I'm in good shape. If I need to upgrade to a bigger plan, it will certainly be worth it. Your hosting plan should accommodate for enough storage and throughput. I don't have specific numbers here but after the first month and a few podcasts, you should have a clearer idea. You'll need to build and post an XML file, which can be a bit tricky if you've never worked with XML. Apple has a good example. Once created, you'll need to post this up on your website in a publicly accessible area. Remember, iTunes doesn't host the podcasts. When a new podcast is posted, the XML fil is updated and iTunes is notified. iTunes then notifies the subscribers a new episode is available, which is downloaded / streamed from your site. Finally, you'll need to setup a feed on your site for the podcast to be played through. You'll also add this feed to your XML file. Once you have your feed up, you'll want to burn it so you can get some stats on your subscribers. Practice Test your setup with a few minutes of talking and recording. Move around a small bit and see how it sounds. Type on the keyboard when you are talking. Move the mouse around and click. Sniff. Not that all this stuff will happen during every podcast, but it's good to hear what it sounds like before you start the podcast for real. After a few minutes, stop the recording and import the file into GarageBand (or whatever software you are using). Play around with the filters and volumes and track-splitting options. Export the final and import it into iTunes, then listen to it. You'll likely need to tweak some of the specific settings in GarageBand (or whatever software you are using) and fields in the XML file. Podcast After all that work, now comes the fun part - podcasting! At this point, everything should be in place for you to record your podcast. Production This will take some time and patience. Typically, I set aside three times the length of the podcast for production. This is probably overkill but I'm still relatively new at podcasting and I'd rather be safe than sorry (even though I've been sorry a few times already). You'll need to listen through it once to make all the edits. Then, you'll need to add an intro, any transitions or chapter marks, and a closing. Then, you'll need to listen to it all packaged up to make sure it sounds the way you are expecting. Then, you'll need to add in all the notes, screenshots, links, descriptions, etc. Then, you'll need to export it, which can take a few minutes depending on the length / size of the podcast. Once done, you'll need to update and post the XML file along with the podcast file itself. Again, this can take some time depending on the size of the podcast. You'll need patience since you're listening to your own voice. Publicize Use all the tools in your arsenal to publicize the podcast once it's live. I normally post create a new post on my site with a description and show notes from the latest episode. I'll send it out through Twitter, Google+, and SoundCloud. When I tweet it out, I'll usually include some Agile hashtags, along with any relevant handles based on the conversation. Keep learning Keep learning about podcasting, your topic, interviewing, collaborating, speaking - everything that goes into making a successful podcast. Kicking off with Ken Schwaber's book (aff) helped me get a better sense of using Scrum when managing projects. From there, I picked up a second (and very light) book, Scrum: a Breathtakingly Brief and Agile Introduction (aff). I joined a local Lean / Kanban Meetup. I've also watched a ton of videos from the perspective of being the interviewer / host, and have read articles on different interviewing and podcasting techniques. That's how I use a podcast to build my authority and visibility on a specific topic. I'm certainly not an expert or massively popular yet but I do see those numbers increasing every week that a new podcast is released. And while I don't have any of this stuff down pat, I'm still excited about learning about it all.